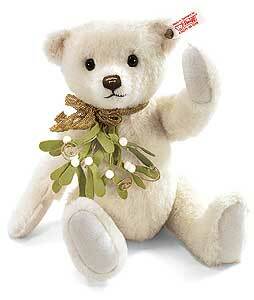 Steiff Limited Edition Mistletoe Christmas Teddy Bear Made of high quality white alpaca, fully jointed, with gold-plated "Button in Ear" . Limited edition of 1500 pieces Worldwide. Size 30cm Comes boxed with certificate.